This 16-bit bus transceiver is built using advanced dual metal CMOS technology. 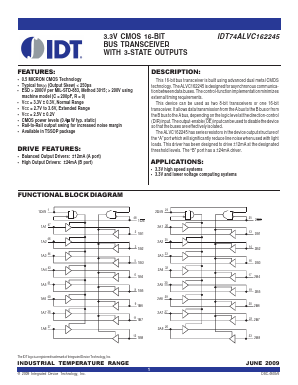 The ALVC162245 is designed for asynchronous communication between data buses. The control-function implementation minimizes external timing requirements. This device can be used as two 8-bit transceivers or one 16-bit transceiver. It allows data transmission from the A bus to the B bus or from the B bus to the A bus, depending on the logic level at the direction-control (DIR) input. The output-enable (OE) input can be used to disable the device so that the buses are effectively isolated. The ALVC162245 has series resistors in the device output structure of the âAâ port which will significantly reduce line noise when used with light loads. This driver has been designed to drive Â±12mA at the designated threshold levels. The âBâ port has a Â±24mA driver.